The first time BYM News visited Port America's Cup little was finished. The Vela y Venta building was a mass of exposed concrete and scaffolding, several bases were mere shells and the only vessel in the canal side marina was a dredger. One of the boats out practising looked equally unfinished, with a bare white hull and equally bare white spinnaker. 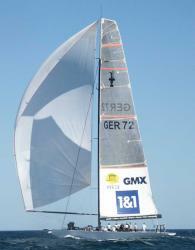 This was GER 72, the first ever German America's Cup entrant. This time round, the German team got off to a smarter start; building enough of a new boat to get a 32nd Cup sail number and signing up Karol Jablonski, shortly after he had steered Desafio Espanol to a great Louis Vuitton final result, taking two wins off favourites Emirates Team New Zealand. Since then things have moved on! Audi has joined United Internet as a main sponsor and Porsche Consulting has become a technology partner. This has moved the German team into a very different financial league from the one it struggled in, during the 32nd America's Cup. Ralph Dommermuth, head of United Internet, said "The first campaign was a great success for the internet company in terms of media recognition. The decisive factors for United Internet AG to continue its engagement have been the announcement of Valencia once again being the venue and the sporting repositioning of the team. In the past few weeks and months and in many one-on-one talks, Michael Scheeren has developed and realised a stable concept. In acquiring Jochen Sch�mann and Karol Jablonski, the head of the syndicate has managed to get two high class celebrities for key positions in the team"
Another major development for the German team has been the acquisition of the Alinghi yacht, SUI 91. This is the yacht that Alinghi used in the last competition, right up to the actual America's Cup. It is the yacht that swept almost all before it in the fleet races, The influence of the ACTs, on the challenger series is small, but still significant, and the acquisition of SUI 91 must be a big plus for the German team. It means that building GER 101 has been abandoned. The other big German plus is that Jochen Sch�mann - 4 times Olympic Gold Medallist, one time ISAF Sailor of the Year, twice on winning America's Cup teams - is to be manage the team. His most recent post was Sailing Director of the winning Alinghi team! Other developments are that Porsche Consulting, a wholly owned subsidiary of Porsche AG, will be responsible for all technological matter; a role that. in the first campaign, Michael Scheeren sometimes had to struggle with. Porsche Consulting will have overall responsibility for developing the new boat and coordinating all those involved, from designers to sub-contractors and boat builders. Audi sponsorship and Schumann joining his home team have been open secrets for weeks, so - apart from the surprise news that Team Germany had acquired SUI 91 - the one shock in today's announcements (September 19, 2007) was the news that Jason Kerr was deserting Team Shosholoza to become chief designer for the German team. Only a few weeks ago, Shosholoza boss Salvatore Sarno told BYM News "Our naval architect, Jason Ker, certainly isn't making any drama about the new boat and the fact that we don't yet have details. He is absolutely convinced that, as soon as we have the details, he can come up with a great design very quickly. In fact, he is very excited and is already working on ideas for the sliding keel mechanism. It is better for everyone that we start from scratch."